Immersive Technologies is the world's most trusted provider of workforce development solutions for mining. In our 20+ years in the mining industry we have successfully provided solutions that deliver real results for our customers. 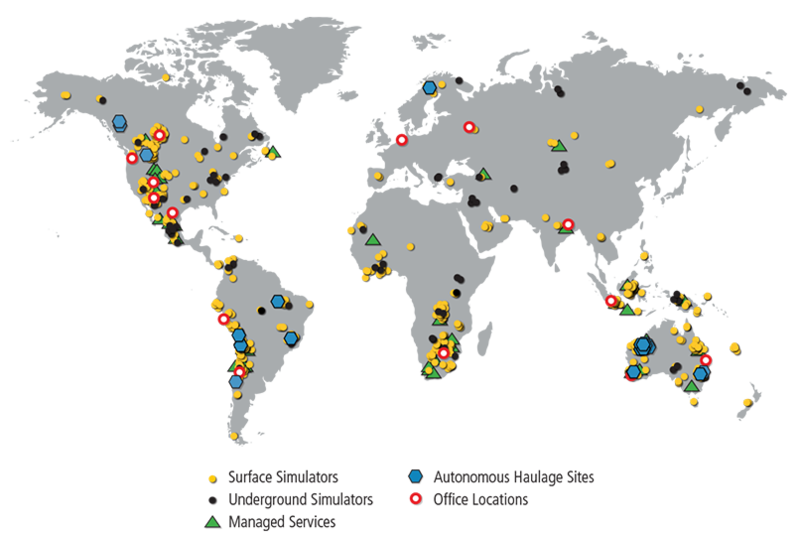 We have built the world's largest customer base spanning 300+ sites and training centers in 44 countries. Each of our staff are qualified in Immersive's exclusive technology integration and operator training methodology. They are also embedded with Immersive's global support network and have direct access to exclusive intellectual property for mine operator training. The end result is a value added service that is fully backed by Immersive Technologies and our demonstrated capability to reduce mining risk. We understand that every site and training center has unique needs that require customization, flexibility and consultation to maximize outcomes. Fully staffed on-site training from Immersive Technologies has been deployed at numerous mines across the globe. Immersive Technologies specialists carry out operator risk assessments, training and drive continuous improvement projects targeted at specific mine operational performance gaps. Learn more about mine sites using Managed Services to improve performance. Our embedded staff add value to your bottom line in a reduced amount of time, have tools and information to avoid pitfalls in training program implementation and drive Real Results in the areas you require. Curriculum Development Variable Cost: Presents a large opportunity risk. Self developed programs often take months to complete with no guaranteed outcome. Fixed Cost: We use a rapid instructional design process tested at over 200 mines. Curriculum targets specific mine needs and is geared towards achieving real results. Labour Cost & Equipment Fixed Cost Fixed cost: However, certain tasks are spread amongst specialists to ensure maximum efficiency and effectiveness. It is difficult to find one person that can do everything. Training and Selection Cost Variable Cost: Risk lies in getting the right person on-board and training for the right skills. Positions often require a specialist skill set. Fixed Cost: IMMT assumes responsibility for selecting and training the embedded resource. Supervision Cost Variable Cost: This is fully dependent on the attributes of the person hired. Supervision is a risk because you will not likely have access to specialists with experience getting real results from sim training. Fixed Cost: IMMT assumes responsibility for supervising and providing specialist support for instructional design, continuous improvement, training best practices, etc. Quality Control and Reporting Fixed Cost: The risk lies in that quality control and reporting is usually not conducted. Outcomes are uncertain. Fixed Cost: IMMT will generate management style reports based on pre-determined KPIs.